Zen Casita X6 at the Porta Fortuna residences is nestled between two golf fairways and the Bay of Banderas. This property offers outstanding Pacific ocean, Bay of Banderas views, and the Sierra Madre Mountain range beyond. With “Mexiterranean” architecture influenced from Italy, the Mediterranean and Mexico, Porta Fortuna provides both stunning residences and the tranquility of a Zen ambience to create an ultra-relaxing residential enclave. 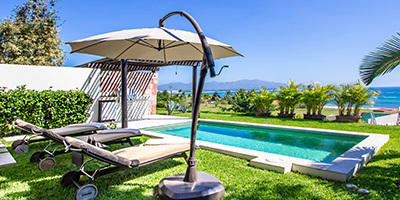 Zen Casita X6 is a beautiful villa, decorated by a professional interior designer. This property has 3 luxurious and spacious bedrooms, each with full bathroom and closet. The large high-end luxury kitchen is open plan allowing one to enjoy the spacious living and dining areas, close by a well-designed powder room with natural light and ventilation. The terrace areas are very nice, it is a real ‘zen’ patio with a large plunge pool. With high-end marble floors throughout, the property is a oasis here in Paradise. The spacious dining and living rooms that opens into a garden area with covered terrace with Viking® grill and refrigerator. On the second level the Master and the second bedroom have direct access to the open terrace with a Jacuzzi and large adjoining terrace. Access to Sufi`s beach club and delicious food is a great plus!